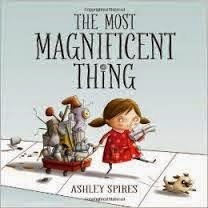 Perfect Picture Book Friday – The Most Magnificent Thing PLUS The Goodnight Ark Giveaway Winner! Boy do I have the most magnificent book to share with you today! It’s one of those books that makes you revel in how perfect it is when you get to the end and want to read it again right away in case you missed anything and then again just to enjoy how much fun it is 🙂 I hope you all like it as much as I do! Why I Like This Book: I love that this story addresses what may be the most common of all childhood emotions: frustration! The little girl has a great idea. She can imagine it perfectly. She knows exactly how it will look. But she has a hard time translating what she sees in her mind’s eye to the physical reality of her most magnificent thing. Her escalation of emotion is real and believable (and kids will relate to it so well!) And the message that sometimes a little distance and a little time to calm down can help improve your perspective is a wonderful one. In the end, she makes something that is just perfect (but I won’t tell you what it is :)) The art is cute and full of humor. The depiction of emotion is spot on. The story touches on imagination and creativity, making things from found objects, dealing with frustration and disappointment, keeping/finding your perspective, not giving up, the idea that it’s okay to make mistakes, and the importance of having a good friend. All around, a book kids will enjoy and parents will be glad to read multiple times. Now, before we all trot off so see what everyone else picked this week, I’d like to take a moment to announce the winner of last week’s giveaway. Laura Sassi and her publisher, Zonderkidz, generously contributed a copy of GOODNIGHT, ARK and the lucky winner is . . .
Congratulations, Sandy! Please email me so we can organize getting you your book! And thanks to everyone who shared their bedtime routines – we all had so much fun reading about them! Thanks for recommending this book, Susanna! My children are both “builders” so frustration frequently runs high in our house. We even have the GoldieBlox you mentioned. I immediately added this book to our library request list! Avast! What a great review ye 'ave 'ere. It be's magnificent! Yer book choice be's a good'un. Happy International Talk Like a Pirate Day! This looks like a good one for our family. (Oddly, when I saw the cover, I immediately thought about Louise Loves Art by Kelly Light) Congratulations to Sandy! This is such a great book! Thanks for sharing! If the illustrations are anything like the jacket art, the book will be more than Magnificent! What a cool idea, too, to build a most magnificent thing…. and then be frustrated by the many ways it can go awry. Great choice! I'm with Sue…the jacket art would be enough for me to grab this one! But then your description hooks me even deeper! Sound so great. I don't have a book this week. I am going to work toward every other week to alternate with a new series I'm doing with my nephew for Poetry Friday. But…I will be clicking the links to go check out the treasures for PPBF! Love this community you've created, Susanna!!! This is adorable. I need grandchildren to read it to. Wow, I know the feeling of envisioning something perfectly and not being able to build it …. when it comes to my writing. 🙂 Perhaps I should get this one for myself. Thanks Susanna! Thanks, Susanna. I love the look of your pick this week. It's nice to be back. 'Hope you had a great vacation. I'm so happy to be linking today – I dropped my computer on the hardwood floor last night – and, as it was on its last legs already, I was afraid I had fried it for good. But, miraculously, after leaving it on all night and praying, it seems to be okay, albeit REALLY slow. I spent 4 hours emailing files to myself last night so I could open them up on a different computer because this one would not copy my files onto a disc. Word to the wise – COPY/SAVE your files somewhere (which I hadn't been doing) – on a disc, in dropbox (lots of people say that is a great place to put your files for safety – will have to check that out) or some other holding tank for files. I don't know about kids but I know I can relate to that sort of frustration! This book looks awesome – I'm adding it to my reading list. And thank you so much to Susanna and Laura Sassi for Goodnight Ark – I'm so excited to have won it! This book sounds absolutely charming. I must read it. Thanks for telling me about it. Duh. So what you're saying is that taking me for a walk is the solution to ALL of Mom's creativity problems! Will somebody please tell her for me? I've been staring at her, but she keeps saying she is not a mind reader. Yeah. I think I know that by now…. As I am learning the craft of picture books i also collect the ones that inspire me and this one sounds divine. Thanks for sharing it. Love the combo of red blue and brown. Is that a good reason to want to buy a PB, you ask? Well, you recommended it , didn't you? Ha! Looks great! An ordinary girl setting out to make the most magnificent thing. I like that alot. Congrats to Sandy!! 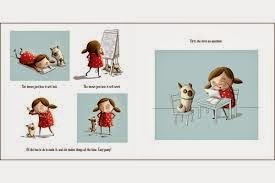 This is a wonderful one 🙂 As writers we can learn plenty from it about pacing, leaving half the story to the illustrator, and how incorporating a strong theme can add an extra layer to our stories. I think you'll like this one, Sandy – it's very well done! And congrats on winning GOODNIGHT ARK! Lucky you! I've (obviously!) already seen it, so I can tell you firsthand what a beautiful book it is! Thanks, Joanne! And it's lovely to see you again 🙂 I really enjoyed your pick for today! Thanks, Sue! This one is a winner in my book 🙂 I hope you get a chance to read it! Glad you like it, Andrea! It sounds like you've read it??? You would love it, Catherine – it's funny! Yes, I have Liam but he is eleven now and doesn't like to be read to anymore. Anyone have activies besides internet games eleven year old boys like? Reading is considered old and not cool. Only for nerds and too not cool for Liam. boo hoo. I must have missed this book when I was going through the S section in the library. I will have to go back and see if I can find it!